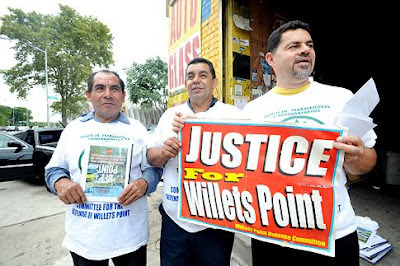 A group of workers and local advocates rallied at Willets Point on Tuesday to demand the city come forward with a relocation plan for small businesses in the area. The 62-acre labyrinth of about 60 auto repair shops, salvage yards and ironworks companies depend on one another to survive, the owners said. "It's important that these businesses be relocated together," said Tatiana Bejar of the Human Rights Project of the Urban Justice Center. The call came after the group released a report that claims the city, in its effort to redevelop the gritty industrial area, was biased against immigrants and minorities. The city is still forming a plan to relocate the businesses, Lombino said. A handful of businesses were shut down in April because of several building code violations. Different agencies were involved with the closings, such as the Police and Fire departments and the Buildings Department, the group said. However, after 40 years of not enforcing any building codes in the area, to suddenly close these businesses when the owners were in negotiations to sell the land was "not a coincidence," said Ted De Barbieri of the Urban Justice Center. City officials disputed the notion. "We've been negotiating with property owners and acquiring parcels for about two years, well before and after the alleged actions took place," said David Lombino, spokesman for the city Economic Development Corp., adding the agency had nothing to do with the buildings getting shut down. "We're looking at relocating some of the businesses in clusters," said Lombino. "We've done it before." They're only looking to do this now? In their own words, they've been working on this for 2 years, yet in all this time they haven't formulated a plan as to how they would relocate businesses? What all this underscores is that the city simply doesn't have its act together-and any effort to exert the right of eminent domain is not only premature, it also courts disaster. That's because without a clear plan of action, or the money to fund it, the entire effort could easily deteriorate and leave the city with a giant empty hole where thriving businesses used to be.